Delicious fried food is almost a guilt-free. These air fryers avoid an oil use so that you can prepare your crispy food much perfect for your regular diet. 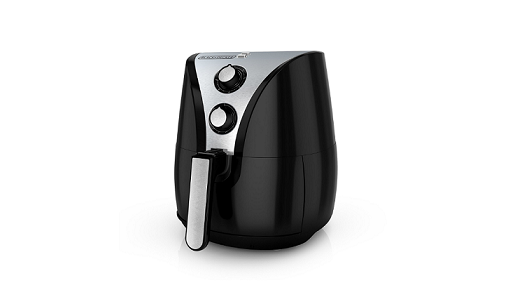 The Black Decker Purifry is an ultimate way to prepare your favorite snacks, and yes oil-free. People often find it difficult to use these fryers due to the risk and danger they might cause in the kitchen. But this Black Decker design is exactly opposite and you can surely have it in your house for regular servings. It is quite safe and easy working fryer which will make your snacks and favorite food much easily without any hassle. Its dual convection fans combines hot air which fry the food faster to get much better and crispier results. Its 2 liter (about 8 cups) capacity is enough for 2-4 servings. Made using a non stick steel makes it easier for cleaning it also are dishwasher safe. Its variable temperature control and indicator lights ranges from 175-400 deg. F enough capable for frying almost all type of food we regularly have. It gives an excellent auto-shut-off mode which makes it easier to set and forget while most of we tend to forget quickly doing other busy things things. This gives a much better oil free crispy touch to your favorite food and help you keep up with your regular diet perfect all the time. Various methods and tips are also included in the instruction manual so that you get an ultimate dry-fry oil-free cooking experience.